A Warm Welcome to you and thanks so much for stopping by. Up for sale today is this beautiful 15" inch Primitive Pink Heart Greeter Doll just perfect for celebrating Mother's Day. This beautiful Heart is sewn from a lightly grunged pink Chenille with a rusty bell on the bottom so if hung on a door it will softly jingle when opened, so sweet! The Heart is garnished with white (greenery), pink pips and dried sweet Annie. 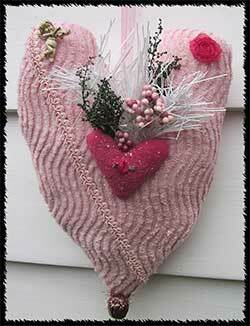 Attached to this special heart is beautiful trim and a hot pink rose. You're going to love this gorgeous Heart. I've sprinkled with glitter to add sparkle and attached a wire loop on her back for easy hanging. 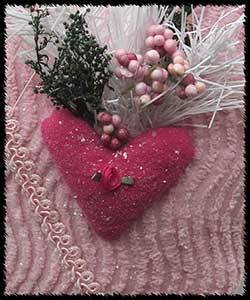 This sweet Greeter Heart will looks absolutely beautiful hanging on your wall, above your fireplace or placed on your front door to greet your family and friends to be enjoyed throughout the cold winter months. Also would make a stunning Mother's Day gift. My home is a smoke free environment. This is a Howling Hag Original and will come to you signed and dated with a hand stamped hang tag.Thanks for looking and be sure to check back often as I add new items regularly.